Having this lovely, empty greenhouse in my backyard has been a mixed blessing these last couple of weeks. We’ve been plagued by electrical problems and I still haven’t been able to get it wired properly. A lesson in delayed gratification perhaps. Meanwhile, the cherry trees have flowered, my daffodils, tulip and irises are up, the shrubs are flowering and there are buds on my plum, cherry and magnolia trees. 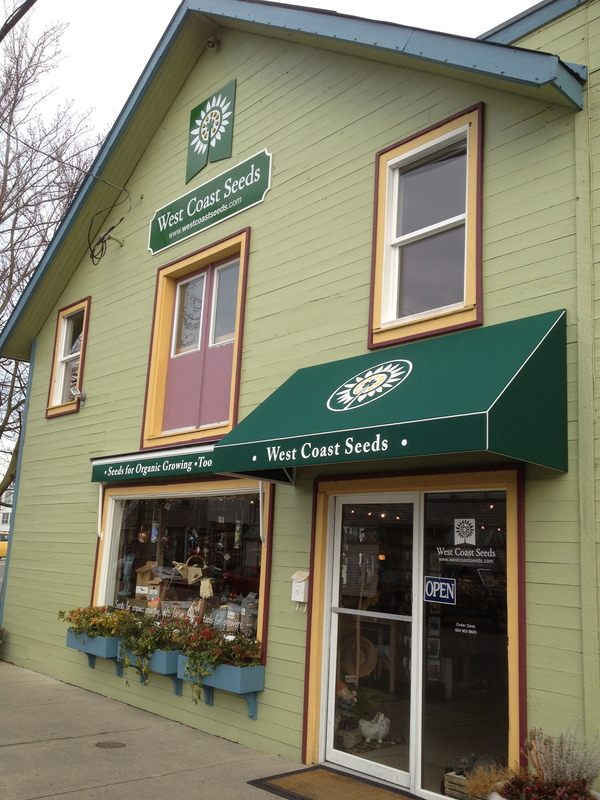 But the first real sign of spring-visiting one of my all time favourite places, West Coast Seeds. And nothing would be served by delaying that! So not only have I been unable to get any seeds started, I also haven’t had the time to get anything in the ground. But the soil is still warming up and of course there is some merit to waiting and not risking losing everything to seed rot. But those of us with window sills, cold frames or working greenhouses can take advantage of the increased hours of sunshine and get things started right away-or several weeks ago, if you’re more organized than I am! -You can buy flats for seeds from the garden centre or make little seed pots out of newspaper, peat or coconut coir to place directly into the garden when the time comes. As long as you choose something with a hole in the bottom to let out excess moisture you’re good to go; even egg cartons or yoghurt containers could work. -Moisten your soil before you plant the seeds. If you put the seeds in first and then water, it could push them to the outer edges where they’ll have a harder time growing. -plant at least two (but no more than three) seeds in each container. You can then choose the healthiest of the three and cut the others down at soil level with some small sharp scissors-easier said then done, I know- I hate that part! -Space the seeds apart evenly, planting them only three times as deep as their width. This is where I’ve made some fatal errors by planting the seeds too deep. Some seeds even require sunlight to germinate and so are best served being laid directly on top of the soil depending on the variety. -putting some plastic wrap or cover over the seeds as they germinate will help keep them humid and encourage growth. You can take it off once the green shoots start to show. -water your seeds regularly, making sure they don’t sit in water, get too soggy and start to rot. Probably the best option is to buy those flats that come with a tray underneath so the water is simply wicked up from below as required. -You can sprinkle a little sphagnum moss, a natural fungicide, over top the seeds to protect them from damping-off, which is a fungal disease that rots seeds and seedlings. -most seeds will germinate well in an air temperature of 18-22 degrees. If your air temperature is cool than that, you can purchase special heating pads for the seeds to be placed on. -at the first sign of sprouting, take them away from direct heat, remove the plastic covering and place in direct sunlight. Now I’m going to see how they develop first without putting in special lighting. Seedlings need more light than full-grown plants, at least 12-16 hours a day, and will grow tall, weak and spindly if they don’t get enough. It wouldn’t surprise me if I end up needing to do this; time will tell. If you have the time and patience to set up a lighting system, apparently most ordinary bulbs will do the trick. They should be placed approximately two inches above the plants and raised as the plants grow. And contrary to old wives tales that claim seedlings require some light-free down time every night to grow properly, apparently 24/7 light is preferable. -if your seed starting medium is soil free and compost free, you will need to fertilize as soon as the first “true” leaves develop (they usually come second, after the first two little ones) and every two weeks thereafter. -they will need to be repotted before they crowd one another or outgrow their containers. As always, I recommend Seasoil. -Having a fan running close by will ensure they grow strong and sturdy. If you don’t have a fan that would work, simply ruffling them a couple of times a day by hand should do the trick. -and of course hardening them off properly before they go into the garden is a necessity. Well, I just didn’t have the heart to ask my husband if I could turn our dining room into a temporary seed farm, so until I can work out some kinks here I’ll have to live vicariously through all of you. Keep me posted! This entry was posted in gardening, greenhouse, greenhouses, organic, organic, Uncategorized, urban farming and tagged seed rot, seed starter, seed starter mix, seedlings, seeds, seeds in greenhouse, starting seeds, starting seeds in greenhouse, starting seeds in windowsill, starting seeds indoors, West Coast Seeds. Bookmark the permalink. Sorry about your greenhouse. I hope you’ll have it up and running soon! A store full of seeds…..OMG I am so there! My husband is sitting next to me shaking his head because he knows I am obsessed with seeds. Thanks for sharing.